Since 1946, Damon Runyon’s unique role has been to identify the most promising scientists early in their careers and provide them with the freedom and resources to pursue the next breakthroughs in cancer research. Our strategy ensures that the most brilliant, creative and audacious scientific minds are singularly focused on this goal. In 1946, the iconic sportswriter and journalist Damon Runyon passed away from throat cancer. His legacy lives on in his memorable stories, which have been transformed into the Broadway hit Guys and Dolls. 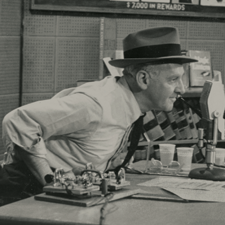 His good friend, famed radio broadcaster Walter Winchell, took to the airwaves shortly after Runyon’s death to implore “Mr. and Mrs. America” to send anything they could spare to fight cancer. It’s time we tried to do something to fight this terrible disease. We must fight back, and together we can do it. Won’t you send me a penny, a nickel, a dime, or a dollar? All of your money will go directly to the cancer fighters, in Damon Runyon’s name. Donations poured in from across the nation in such great numbers that Winchell was able to establish the “Damon Runyon Cancer Memorial Fund.” He promised to use its coffers to support the most promising cancer scientists across the nation. With the help of celebrity supporters like Marlene Dietrich, Bob Hope, Milton Berle, Marilyn Monroe and Joe DiMaggio, Winchell led the organization’s fundraising until his own death from cancer in 1972. Since 1946, we have invested over $330 million in more than 3,700 exceptional scientists. Damon Runyon cancer researchers have made extraordinary breakthroughs in every area of cancer prevention, diagnosis and treatment. To this day, we support the next generation of leaders: emerging talent with unique insights, drive and boundless vision. We will not stop until we have the tools to prevent or cure all cancers.